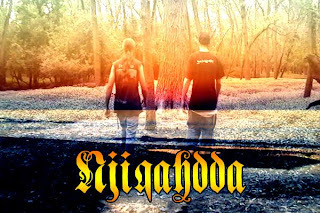 One of the bands I've really come to love over the past year or so is the band Njiqahdda, who make an amazingly atmospheric form of metal that really defies categorization. There are many elements to the band's music that allow and almost compel the listener to be transported to another realm or dimension while remaining cognizant of his or her immediate surroundings. To truly engage this band's music is to put all else aside and go wherever it may take you. Their back-catalog is as wildly impressive as it is huge, and they were kind enough to take some time to answer a bunch of questions for me. Part of the reason I love this band so much is that there is a perpetual sense of mystery, and while I wanted to learn some things about the band, I hoped to be able to retain that sense of mystery. I think we were successful in this regard, and I hope you agree. HSS: Thanks for agreeing to do this interview, and thanks for being patient with me. First, for someone who has never heard Njiqahdda before, how would you describe the band? > Not a problem. We rarely get an opportunity to speak at length about what we do, so any chance that it comes up, we consider to be a blessing. Thank you for choosing us to speak with, for we truly do appreciate it. I am not entirely sure how we would describe our music to someone who has never heard us, maybe something along the lines of black metal with a bunch of twists and turns that are atypical for the genre and a lyrical/philosophical concept that is mostly unheard of in our kind of music. Come into Njiqahdda not expecting anything, but to learn that nothing is concrete, all things change and all things are possible in time. Where does Njiqahdda find inspiration for its art? Where do you find your musical inspirations and influences coming from? > The inspiration for the art we create comes from life itself and everything that comes with it. Life, death, relationships, struggles, dreams, nature, politics, questions regarding spirituality, the desire to transcend normal life, etc. There is so much involved with life that we could never run out of inspiration for creation. I think that is one of the reasons why we have been able to produce as much material as we have, but keep it on a heartfelt level and not come off as contrived or rehashed. As far as musical influences, there are many, but there is one in particular that is solely responsible for the creation and work ethic of our band; Neurosis. We happen to believe that Neurosis is THE most important heavy music band in the last 30 or so years (quite possibly ever to be honest) and they have been the biggest influence on our music, without them, there would not be/never have been a Njiqahdda. Other music that we have a strong appreciation for; Agalloch, Deftones, Shai Hulud, Burzum, At The Drive-In, Defeated Sanity, Opeth, Weakling, Darkthrone, Swans...this list could go on forever to be honest. We also have tons of visual artists, authors and filmmakers that are important to us. I would not say that we are influenced by them per se, but more so have a strong appreciation for what they have done and continue to do. Work ethic, ideals and abstraction of reality are more of an influence that a certain sonic or visual approach. Interesting – “the desire to transcend normal life.” Does creating music help you to do that, in a sense? > Absolutely. Music is the place we come to for sanctuary, solitude, sanity, etc. Njiqahdda is the place where we can put all the dramatics of life to the side and just be content concentrating on the singular moment. There is no illness, sadness, pain and death in Njiqahdda, while we do touch on those subjects quite a bit, Njiqahdda is the expression of life in a pure form. Removed from all the negativity that seems to make up the bulk of existence. It allows us to be part of something more profound than; birth, work, taxes, death. I think everyone needs some kind of transcendental escape in life; all the burdens and frustration can be overwhelming if there is no break in it all. Music is our break and chance to escape the drudge of ‘real’ life. You also mentioned the “abstraction of reality.” That’s a very good way to describe what goes on in my mind when I listen to your music - things are blurred, sometimes only to become clearer by the time I get to the end of an album. Divisionals is a good example of this. After a song is completely written, recorded, mixed, and mastered, and you have a chance to listen to the completed piece, do you perhaps find an abstraction of reality there? > This is one of the main premises for Njiqahdda; to create an altered state of reality through artistic means. The long song lengths, odd lyrical matter, other languages and continually evolving structures are our way of creating an abstract version of reality where one has the ability to take a back seat and allow the art to take you to entirely different plane of existence. To see things in a way that you may not normally see them. It might not make sense at first, but by the end of the trip, it all falls into place and each piece can be analyzed as an important stepping stone in the journey. To us the best art is that which you get lost in; time stands still and all concentration is focused on what is before you. It is more or less along the lines of a religious experience, after witnessing it, it changes you, whether you see it right away or not. But afterwards, you can never go back to the way it once was. You’re involved in a bunch of other bands besides Njiqahdda, such as Njiijn, Oaks of Bethel, and Funeral Eclipse. Njiijn is said to be the other side of Njiqahdda, so to speak. Can you explain this, and perhaps talk about the differences in the other projects? > Njiqahdda is the exploration of musical song writing with a flair for the experimental. Njiijn is the exploration of straight-up sound, with the occasional song coming out of all the chaos. We feel more freedom being able to have the two projects separate, but still allowing them to be an extension of the same river of creation. Njiqahdda and Njiijn are one in the same, just manifested in different ways; different sonic palettes forming the same type of painting, so to speak. Oaks of Bethel is our chance to create intentionally lo-fi and non-progressive music. With the amount of labored songwriting, production work, lyrical conceptualization and all around intensity that goes into Njiqahdda/Njiijn, it gives us an outlet to kind of step back and just hammer away. Plus, it allows us to create an entirely new atmosphere than what usually comes out of Njiqahdda or any of our other projects. It’s kind of a refreshing way to rethink our musical landscape and take a mental break. This by no means should sound as if there is less work put into OoB; it just seems to flow a bit more naturally than our main projects. Funeral Eclipse is our more 'typical' project. One release every year or so and is much more straightforward than our other projects. It essentially was birthed out of the desire to create a hybrid of melodic Swedish and primitive Norwegian black metal. Oddly enough, this project is a bit more complex for us to compose songs for since it is so stripped down and straightforward. We have found it to be incredibly helpful though, it makes us have to step out of the box and write in a way that we would normally never write. Your label, EEE Recordings, recently released the Njiqahdda album Il' Ijni Talii Humaantii and the Oaks of Bethel album The Curse of Failure Upon Humanity. Can you talk about the conceptual connection between these albums? Is this something you’ve done before, where one of your band’s projects is directly connected to that of another? > The conceptual link between the two has stemmed from numerous sources within our lives, but the main one is that we cannot help but feel there is a weight upon human existence, more so in westernized culture, that we are ultimately predestined for failure. There is such a large onus to be 'successful' in regards to making large amounts of money, having power over others, being popular, etc. and so many people live and die in the pursuit of a dream that in many respects, is almost impossible to achieve. There are very few who can honestly admit to being a 'success' without selling themselves out or destroying others in their path to achieving their idea of success. People seem to forget that you need the people who work at gas stations, clean up vomit at high schools, etc., and that not all people are going to be rich and famous. Does that make them less successful? Absolutely not. But to those who have written the script on what is successful in modern culture, these people are considered lowly and beneath them. This is wrong and we do not believe it for one second. So the 'curse of failure' is exactly that; society putting unreasonable goals in front of us to achieve, even if we wish not to achieve them, thus having to live in the shadow of failure, even if we do not believe we have failed. Almost as if what you think of yourself does not matter, the masses dictate your existence. For the first time in our musical lifespan, the lyrics for those two albums were very, very negative and angry. It was interesting to vent our frustrations in such a volatile way, simply because we had never done it that blatantly before. We have never done anything like that before, where there is a direct link between two recordings from separate musical entities. One thing I am not sure people know, but the Njiqahdda album is supposed to play first and if you pay close attention, you can hear that the final riff on the Njiqahdda album is the first riff on the OoB album, just reworked a bit. We have discussed doing more of this in the future, if we feel called to do it again. We are both very pleased with how that musical process worked out. You’re one of the most prolific recording artists that I’m aware of, and much if it is-self released on EEE. Is there a great deal of material that gets written and recorded but never released? How do you decide what gets put out and what doesn’t? > At this point, I believe we have about 6 or 7 albums worth of material that has never seen the light outside of the studio. Sometimes we hit a wall where we are not completely convinced to release certain rituals, for whatever reason. A good example is our first two demos; it took us years to finally decide that we could comfortably release them into the public stream and not be awkward about it. Same goes with a few other releases as well, sometimes we just need to sit and let the music marinate in our subconscious’s for a while, so we can be fully comfortable with them being 'out there'. There is no real formula to deciding what does and does not get released. It is more or less dictated on how strongly we feel about said manifestations, some are so powerful to us that we immediately know they must be released, some are too personal and get shelved for a period of time. It’s all about feeling I suppose. There are no label deadlines, budget requirements or pressure coming from outside sources, so we can essentially work in any manner that we are comfortable with, which has been extremely beneficial to us as a band. There is obviously a deep level of experimentation going on though the Njiqahdda discography, as you’ve incorporated many different styles of music - metal, drone, ambient, folk, atmospheric rock, tribal percussions, and even pulsing electronic house beats (at the end of Sovenstraa) into the whole that is Njiqahdda. To me, at least, there is something that I can’t quite put my finger on that characterizes the Njimajikal sound if you will, and seems to be present in all of your works, acting almost like a glue to make your entire catalogue very cohesive. Has this been a conscious effort, to remain true to one certain something that makes up the various sounds in Njiqahdda’s music? > It has absolutely been a conscious effort to make all of our statements cohesive, in one way or another. There will never be a point in time where we do something that has been completely out of scope for us. We will always have strong metallic roots in our music, but there will always be a large degree of experimentation happening. Njiqahdda to us is complete artistic freedom, to do what we want, whenever we wish to do it. That was essentially the main focus on starting the project, to be able to create art that has no limitations and is not stuck to residing in one specific genre. We have been doing atypical soundscapes since our demo days and it has been incredibly beneficial so far. Our listeners have learned to always expect the unexpected from us; I do not believe there are a lot of artists that can say the same thing, especially in metal music. We are grateful for that. One thing shall always remain true about Njiqahdda; we will never sell ourselves out and/or short for any reason. This band, this art is far too personal and important to us to hand it over for money, fame or anything else as pathetic. It might be easy for one unfamiliar with your work to say that there can’t be much meaning to any of this, since there is so much that is released; I’ve heard folks say that. But to me, this music all sounds very genuine, heartfelt, and meaningful. I imagine it must be an exhaustive process to write and record so much music with so much passion. What keeps you going? > People are quick to judge that which they have no understanding of. Every second of every song, film and text that we create is completely genuine. We pour our hearts, minds and spirits into everything that we do, no matter how large or small. Njiqahdda is the largest part of our lives and has become very important to our identities in our personal lives. We are genuine and heartfelt people, it’s only natural that our art would be of the same degree. The fact that we have yet to experience writers block and/or are reduced to making rehashed, emotionless art is something that is beyond us. We are fortunate to be able to create on the level that we do, but we are both firmly convinced that we are only vessels in which this energy flows, thus why we can produce as much as we do. This energy is not ours. There are others that Njiqahdda could be channeled through, we just happen to be the ones who are chosen to do it at this point. It is incredibly taxing for us to create to the degree that we do, to remove ourselves completely and just let the energy flow through us is no easy feat. But withstanding all of that, it is our job to do this, whether we accept it or not. As long as we are both alive, we will always give all that we have to this. Njiqahdda is something we both made the conscious decision to dedicate our entire lives to, no matter how difficult it may become. Njiqahdda will exist until one or both of us are no longer here on earth. It’s a lifetime commitment. Life is the sole reason we keep going, every day that we are alive, we will have enough inspiration to create something. There are too many battles to fight, too much injustice in the world, too much sadness to ever not be able to keep going. It sounds as if this energy that flows through the two of you, that compels you to make this music, has left you no choice but to do so. That said, though, it still sounds as if this is very much a labor of love. Is that accurate? > I truly believe that even if we wanted to put the band to rest and never create again, that it would be virtually impossible to do so. This energy courses through our veins, manifests in our minds and is expelled by our spirits. It is something so incredibly strong that we have no choice but to ‘go with the flow’, so to speak. Even when we do not want to create, if the energy is there, it will come out on its own, regardless of what we want. We do not control it in any way, shape or form. Regardless of this, what we do is entirely a labor of love. The continual need to create more and more is purely out of the passion and love for what we do. I can firmly assure that we are the most attentive and active listeners to our music. Njiqahdda is the most listened to music for both of us, simply because we love what we do. Njiqahdda is the only music we can both readily identify with 100%, all the time and I can honestly say for the both of us that Njiqahdda is our favorite musical project in all that exists. This is one of the reasons I find a lot of the internet haters to be absolutely hilarious; people think we do this for money or to be popular or whatever. I can honestly say we do it for none of the reasons listed. We make virtually no money from Njiqahdda, we have in fact acquired more debt than anything, and we do not even come close to breaking even. We do not do it to be popular; we do not use our real names, never take band photos where you can identify who we are and we never tell anyone (who does not already know) that we are even in this band. We keep our silence and let the art speak for itself, who we are is not important, only what we create is. We are not rock stars and never will be. We are as much against that stuff as one could be. We are two ‘normal’ people who work crap jobs, drive dumpy cars and enjoy our solitude to the fullest. Some of your works have both and audio and visual components. How does the birthing process work, in those instances where there are both? Does the song come first, later to be followed by a video production? > More often than not, the song comes first. The only instance in which it did not was the UCXQ film; all the video was first filmed and then put to music. If we had the time and resources, we would do visuals/films for every song we create. We feel that art should be developed and manifested wholly; visuals, ideals, sonics, etc. It should all be cohesive and make sense as it weaves in and out of each other. Plus, I personally went to school for visual arts, so learning on a scholastic level the intricacies of visual art helped in fully realizing that which Njiqahdda needed to function at the level that it would/does. What is the origin of the Njiijn language that is used in much of your art? Is it a fully developed language? > Njiijn tongue is deeply rooted in the languages of non-western culture. We have always been fascinated with outside culture and language, therefore we wanted to create something that channeled our love for all those things, but reduce them into an entity that was purely our own. It also first began to manifest in meditative rituals, so in a way it was developed far beyond us and passed down as a gift of sorts. It is not a fully developed language at this point, but becomes closer to that reality the more that we work with and utilize it. It is always being retooled and idealized to make more sense. To an extent it is a living language, because it constantly changes, adapts and becomes more in-depth. We hope to one day have it perfected to the point that it could be explained and taught on an educational level, but for now it only exists between the two of us and the spiritual energy from which it comes. The songs on the Njimajikal Arts album (2007) are written in English, and as far as I can tell, you’ve only used English on two releases since – Of Beasts and Blossoms, a neofolkish release from earlier this year, and then on Divisionals, also from this year, which features both English and Njiijn. Has there been a conscious and intentional effort to stay away from English until just recently? Do you plan on using English more in the future? > The inclusion of whatever language we use is purely dictated on the meditative process that precedes the recording ceremonies. If lyrics are passed to us in the Njiijn tongue, they are written as such, if in English, the same rule applies. There is never an intentional process to include or exclude the English language, it is what we know best, but is not always the best answer; it happens as it happens. We will always use both languages in some form or function. The Njiijn language is part of what gives us our identity and unique personality, we would never abandon that, especially in the respect that it allows us to convey things that we would have no other way to explain. As is the case with many languages, not everything can be properly translated into English without some kind of loss in translation. There is always a loss of mysticism in language conversion. How do you keep the pure artistic endeavor of writing, arranging, performing and recording music separate from the business aspect of running the label? > In complete honesty, it is not a simple task. It is more of a burden than anything else. It would be incredible to be part of an outside record label, only for the fact that we would not have to concern ourselves with the business end of it all and we could focus solely on the artistic side of the band. If we enjoy the music we have created, then to us it is a success, but I would be a liar if I did not admit that knowingly tracking sales did not hinder that scenario. Running our own label has been beneficial in the respect of having zero pressure in regards to anything and not having to worry about ourselves getting screwed over in some kind of bogus record deal. It has also had its down sides in regards to extremely small budget limitations, distribution, etc. There are many things at this point in time that we simply cannot achieve on our own, purely because of financial issues. We are also very knowing of the fact that for all of the 'success' we have achieved, there is not a record label on the planet that would even consider working with us. Our ideologies, sound and concepts are far beyond the scope of typical record labels. No one is going to be making a big buck on Njiqahdda anytime soon and therefore have no use for us. You will be hard-pressed to find a record label that does not care about anything BUT making money, no matter how small. So doing the label at this point is mostly out of necessity, we know our intentions and making money is not one of them, so we can make our music available to those who want it without regard to having to worry about being dropped by labels or achieving certain monetary quotas to keep us aboard. If we sell two copies of an album, we will still always have a home to come back to. 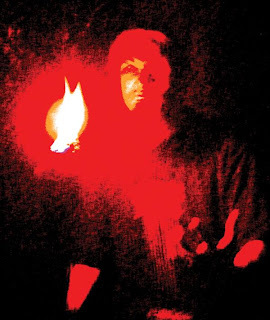 Pagan Flames released last year’s Yrg Alms to a seeming consensus of positive reviews. Can you talk about the experience of working with them? > Pagan Flames are two of the most genuine, honest and nicest fellows we have ever had the honor of talking to, meeting and working with. They run a great label that is concerned with one thing and one thing only; releasing the best music that they can find. They do not do it for money, which is a rarity in the music ‘business’. We absolutely love them and hope to work with them for many, many years. We have never had a better experience with a record label in our existence and highly doubt that we will ever in the future. They nurture their artists, let them have all the control that they wish to have, over everything and that truly is a beautiful thing. While on the subject of Yrg Alms, can you give us some insight into what precipitated the reinterpretation of that piece on the II album? Were you at all unsatisfied with the original? > Not at all, we were very pleased with how Yrg Alms had turned out. After recording that album, we had joked about the idea of ‘what would this album sound like if we completely reworked it into something that barely resembled the original?’. So we took up the task of doing so, twisting everything in and out of itself to create something entirely removed from its original incarnation. To us, you can still definitely tell it is Yrg Alms, but filtered and reduced to pure essence and emotion. It was an interesting experience to reconstruct an album of that magnitude. We may do it again in the future, only time will tell. There have been a few cassette releases of Njiqahdda music, but everything, it seems, has been released on CD. Since HSS gives a lot of attention to vinyl, I have to ask: Have you ever thought of pressing any of the bigger albums, such as Divisionals or Yrg Alms on vinyl? Any plans to do vinyl in the future? > In all sincerity, this is one thing that we have not been able to see through at this point. Our ultimate goal has always been to get one of our albums pressed on vinyl. Vinyl is our favorite format to listen to music on and is the one singular thing that we have wanted to accomplish since the inception of the band. Unfortunately at this point in time, it is not even close to being a likely scenario, simply because it costs far too much money to do. We live on incredibly tight budgets and at this point, a vinyl release could not even be considered in that budget. Unless one of us secures a job that makes a ton of money or a label steps up to take the financial burden of doing so, it is not even considerable right now. I give you the most sincere thanks for taking the time to do this interview, so how it concludes is up to you. Anything else you’d like to add? > We would like to return the most sincere of thanks for taking the time and consideration to interview us. Thank you for also being as supportive as you have to our projects and label. You have no idea how much we appreciate it, from the bottom of our hearts. We would like to take this opportunity to thank all of our listeners and supporters, your favor has and will always been incredibly appreciated. We are grateful to be able to serve you and share a portion of your lives. We are humbled and extremely thankful for each and every one of you. Never give up hope, never sell yourself short and always be your best friend and biggest critic in everything. Life can be an inferno of unpleasant tragedy, but always look at it directly in the eye and assure it that you will not be defeated without a fight. Hope is never lost, the battle is never over, never let anyone or the world take anything away from you. Life is ours to live, so live it, be the best person you can and be aware that as long as you have hope in yourself and are willing to do things in an honorable way, there is no failure. Not now, not ever. Wow. Again, many thanks for your time, and especially for your honesty and integrity. I hope our readers get as much out of this as I did. > No worries brother, thank you very, very, very much for doing this. It is our pleasure and honor. Keep up the great work. If you're interested in reading more about the band and keeping up with what they're doing, go here to check them out. You'll find a link there to a free download of a new EP, featuring covers of the Deftones, Burzum, and more. If you want to purchase some of the band's work, go to EEE Recordings. one hell of an interview. and one hell of a band. the recordings i have are some of my all time favorites. nice to see work like this still being done.